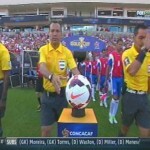 We go immediately to the Rio Tinto Stadium inside Sandy Utah as Belize came out to face Costa Rica in its 2nd match in CONCACAF Gold Cup 2013. As the National Anthem of Belize takes center stage in the pre-game ceremonies on Saturday, we get this view of our starting eleven who are very cognizant of the importance of today’s outing. Nevertheless we’re some ten minutes in when Saloria picks out Cunningham who heads it in for the opening goal. However the lines man rules offside to negate the goal but truth is it was a well tuned run and the goal is good. Of course we will take the call. In the meantime Evan Mariano and Deon McCaulley work the two man game to the max on this press and we have no doubt that McCaulley is fouled inside the box and should have earned a penalty call. At the half the score is nil-nil. Immediately into 2nd half Woodrow West is asked to come up with a big time save and he does. Unfortunately at the 49th minute Dalton Eiley uses the wrong foot to clear this pass across the goal mouth and just like that the own goal gives Costa Rica a 1-zip lead. Eiley is distraught but what’s done cannot be undone. Celsio Borges of Costa Rica then maneuvers through traffic for a one on one look at Woodrow West only to pull the shot wide. 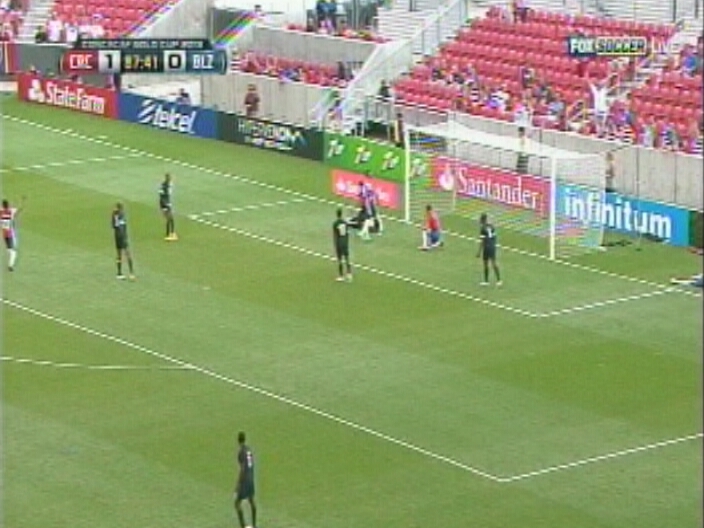 A second goal by Belize almost scores here when Elroy Smith stretches with the left foot to prevent this ball from going across the goal and we’re truly fortunate that it rolls outside the near upright thanks to a finger touch by Woodrow West. West then is asked to make a save on this long distance blast from Borges and he is up to the task. Still folks this save by Woodrow West is probably the best so far in the Gold Cup. The fish across the face og goal is perfect and the header is on target but West somehow read the play right and react in time and then has to make a 2nd save off the same play. 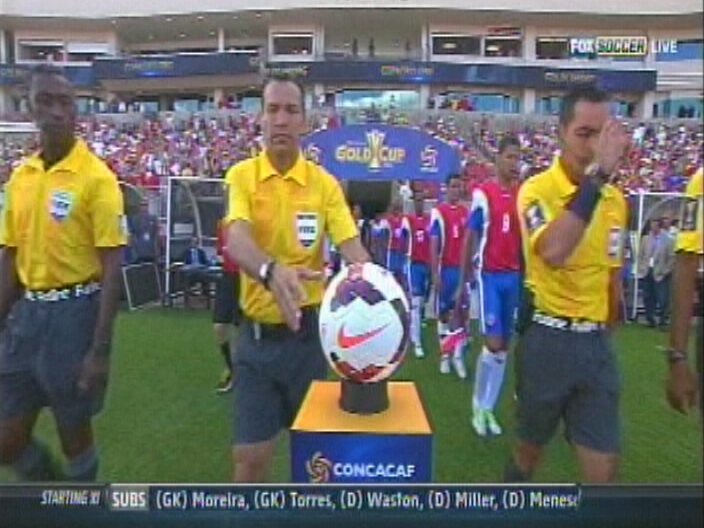 It is my belief Woodrow West and Shane Orio are the two best goalkeepers in this tournament. In terms of drama, we’re in the last minute of extra time when Elroy Smith fires this corner kick into the box, the goalkeeper, Pepperton, punches it out to Trevor Lennon whose header was heading to the back of the net except for this heroic defensive effort that gets it off the field. 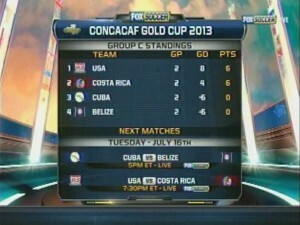 Belize looses its 2nd match in a 1-zip final and our chance to advance has now been minimalized. 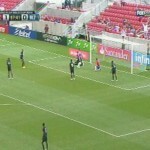 In the earlier Group C match on Saturday the U.S. beat Cuba 4 to 1 which means the U.S. and Costa Rica with 6 points apiece will move on to the next round. Thus tomorrow’s schedule finds Belize facing Cuba at 3:30 p.m. and 1st round play in Group C concludes with the U.S. taking on Costa Rica at Hartford, Connecticut. There is an outside chance that a win over Cuba could get Belize into the sudden death round but even with a win we don’t control our destiny. 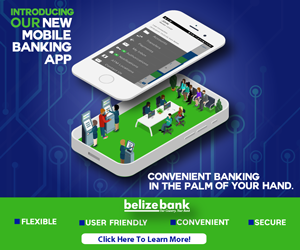 In basketball news Galen Eagles took on the Belize All Stars Friday night at Birds Isle in an effort to raise funds for the National Football Team. The All Stars jump out fast & furious as Winston Pratt hooks up Brian White who would lead all players tonight with 23 points and 13 rebounds. It’s more All Stars when Keith Acosta deals to Winston Pratt who sinks the long deuce for his 29 game points to go along with 12 boards. At the other end Jordan Young goes to the left hand to strike for 2 of his 7 points for the Eagles. Of course you know superman is still a bad man and Keith Acosta slams it home and would put up 13 points tonight. Talk about slam dunking well watch Andrew Ortiz reply in kind for Galen and he would tally 12 points and pull 8 boards. Raul Roches in heavy traffic rises up for 2 points and would strike for a 2 doubles of 18 points 11 rebounds. And then he says watch me fly as he hammers home the right handed slam. Keith Acosta then decide he wants three and guess what he gets three. And here is Brian White getting the put back off his own missed shot as Belize All Stars record the 80 to 71 big W.